POLICE were called to restore order when violence broke out after more than 8 000 job seekers thronged the Egodini Mall project site in Bulawayo yesterday for recruitment for the first phase of the project. Some people started queuing at the contact centre as early as 4AM in a bid to be recruited under phase one of the $60 million project to be completed in November 2019. 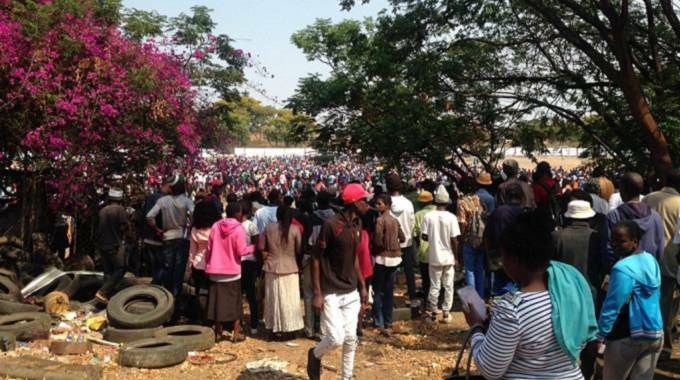 Terracotta Private Limited director Mr Thulani Moyo said they were overwhelmed by the number of people who responded to their call for jobs and they had to suspend giving out forms for people to apply after violence broke out. People frustrated with the process started the violence. “So many people came, more than we had prepared for. We just need about 400 people for the first phase but so far close to 8 000 people have gathered here,” he said in an interview in the morning. Addressing journalists at a press conference in the afternoon after the process was halted, Mr Moyo applauded the police for a sterling job in controlling the crowds. “Upon opening the contact centre, we got an overwhelming response from people who came to the centre to collect application forms to register in the database. “Fortunately, we had support from the police and other security clusters to try and control people,” said Mr Moyo. He said they had to abort the form distribution process after violence erupted as some people were attacking those that had received forms. “Job seekers were being attacked by other people who were snatching application forms from them. “We were advised by the police to stop issuing the forms as it looked like those who got them were not safe as they were being attacked for them,” Mr Moyo said. “In terms of employment process, we were ready and hoping that some people would collect application forms, attach supporting documents and submit. We anticipated that some people would come today, some tomorrow, and the day after for the rest of these 30 days. He said people can start collecting the forms from today to November 30 and then come back to the contact centre for submission. “If you come and see there is a queue and it is too long, there is no need to join it, you can come back the following day. We can take 300 – 350 applications each day for registrations,” Mr Moyo said. He said forms were available at the contact centre for free although some youths were selling copies for 50 cents each. “We are distributing forms for free but if you want to buy it on the streets, it is ok, you can buy it from someone who is photocopying the form and selling it on the streets. That is a private arrangement,” said Mr Moyo. Actual construction works are expected to begin soon after completion of the registration process.